The Somali is a longhaired Abyssinian cat with a beautiful ticked coat and a long plumed tail. They have the same personality as the Abyssinian being outgoing, energetic, confident, good-tempered and affectionate. The Somali is a long-haired Abyssinian and originates from Abyssinian breeding programmes where occasionally a litter of Abyssinians would throw a longhaired cat. Despite the name, the breed was actually developed in the United States. Back to the Somali, the gene responsible for long hair in the cat is recessive, and the cat needs two copies of the gene to have long hair. A cat can have short hair but carry the recessive gene for long hair. Mated to another short-haired cat who also carries the recessive longhair gene and the offspring can be born with short or long hair. In the past, these longhaired Abyssinians were sold as pets, but at a later stage, breeders decided to develop these cats and establish a new breed. This all started with an American lady by the name of Evelyn Mague, an Abyssinian breeder. In 1967, a male kitten was born who was named George. It is George who was to become the catalyst for the Somali breed development. George was the result of a mating between Trill-By, owned by Charlotte Lohmeyer and Evelyn’s stud, Lynn-Lee’s Lord Dublin. In this litter was a fuzzy male who looked like the odd longhaired Abyssinian that occasionally cropped up in the breed. Charlotte gave this kitten away. At the time, Evelyn also rescued cats, one day a lady turned up on her doorstep to surrender a cat who she had become allergic to. This cat was George. As he had not been around other cats since he was a young kitten, and didn’t get along well with Evelyn’s cats. The kindest thing to do was find him a new home. Evelyn felt it very unfair that these beautiful longhaired cats were so devalued and decided to show and develop them. There was considerable resistance to the development of the Somali breed initially. The Somali Cat Club was formed in 1972 and the breed was exported to Europe in 1977 where breeding programmes were established. Back in the USA, Somali’s were awarded championship status with the CFA in 1978. 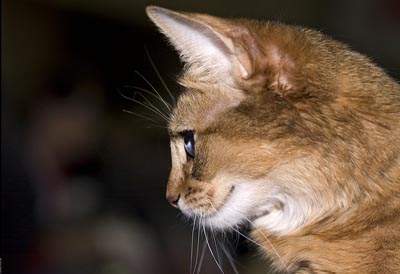 The Somali has a similar shape to the Abyssinian, but with the longer coat. Unlike other long-haired breeds, the Somali has one or two big sheds a year but otherwise, loses little hair. Medium size, well muscled, with a long and lean body. The legs are slim, with small, oval paws with fine bone structure. Broad, with almond almond-shaped low set ears. Medium-long with a ruff and a thick, plumed tail. The coat takes up to two years to fully develop. All Somalis have ticked coats, which means each hair the base colour is interrupted by two or three bands of darker pigment. The tip of the hair is always dark. The Somali comes in the following colours, red (sorrel); blue; fawn and silver. 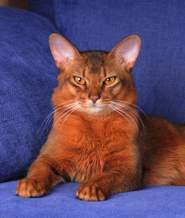 The Somali shares the same personality as the Abyssinian. They are an extremely active breed of cat who love to be up high. They are extroverted, gregarious, charming, inquisitive, who are on the go all the time. This is a breed who is great fun to share a home with, loving to be with their human companions and help in whatever you may be doing. They do not do well if left for long periods of time on their own. Their intelligence makes them an easy breed to leash train. This is a good thing as their inquisitive nature can get them into trouble, so they should not roam outdoors on their own. The coat is relatively easy to care for and requires only a 5-minute groom once or twice a week to get rid of loose hairs.